Online Delivery Charges and Details. If you have a business account set up with Green-tech please contact your sale advisor for business delivery times and rates on 01423 332100. Products are dispatched either as a parcel, number of parcels or a pallet. 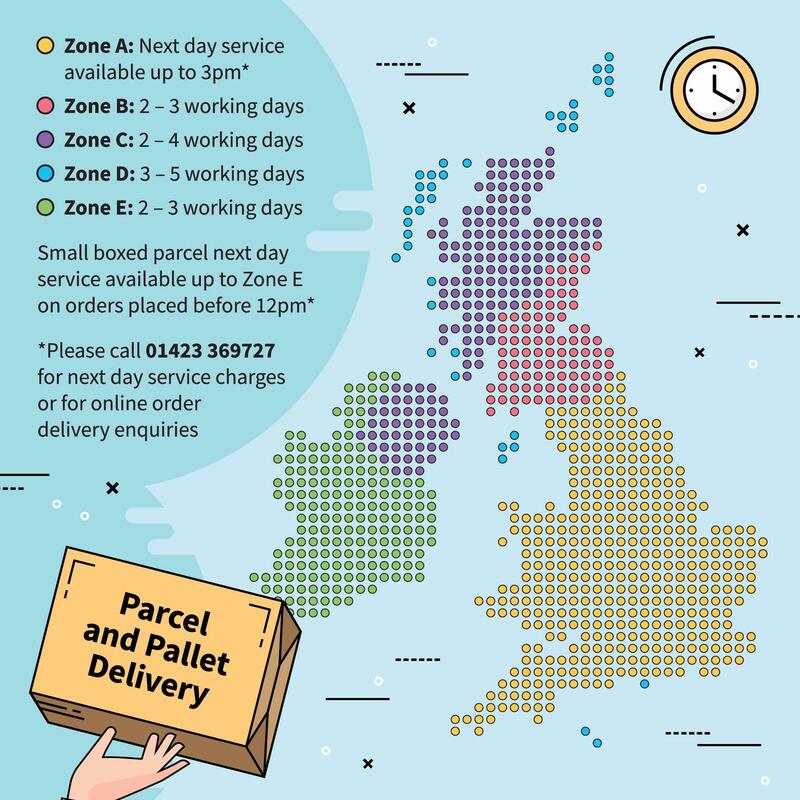 If you pay our standard delivery fee subject to zone area charge. The order will be process and sent out through either our Eco courier service for parcel orders or Eco pallet service. The eco service is a 2 - 5 working day delivery service subject to zone of delivery and stock availability. Orders placed before 1pm (Mon-Fri) will be processed same day and aimed to be dispatched the same working day (subject to being in stock at Green-tech). Any items dispatched directly from our suppliers may require an extended delivery date, this will be advised at confirmation of order. The next working day delivery service operates on a courier service system and 1 working day pallet delivery service, for orders placed before 3pm (Mon-Fri) will be processed and aimed to be dispatched the same working day (subject to being in stock at Green-tech). Any items dispatched directly from our suppliers may require an extended delivery date, this will be advised at confirmation of order. Pond liners are not available on a next day service. Please note on next day deliverers we shall be under no liability for any delay or failure to deliver products if the delay or failure is wholly or partly caused by circumstances beyond our control. For example delivery companies being delayed due to traffic incidents, breakdowns or weather conditions. On Large quantity size orders or heavy products, these orders are usually sent out palletised. On pallet deliveries our delivery lorries will require good access to site, an open, flat, hard-standing space for offload, with use of a taillift. Please provide us with an up to date contact number to pass over to the delivery company to contact you if there is any issues with delivery or to make you aware of drop off time. If you have any site access issues or wish to pass over directions to site please contact us at time of ordering. If you are not home or on site at time of delivery our courier service will attempt to leave the order in a safe place on the site or with a neighbour. When signing for the order please inspect before accepting, if goods are received damaged, you must inform the delivery driver immediately and ensure that this is added your signed proof of delivery - If you notice damage to goods delivered that you didn't inform the driver, please notify us with 24hours of receipt and email photography's of the damage to sales@green-tech.co.uk. Or if you believe a parcel or part of your order to be missing, please sign for the delivery as a partial delivery and notify us straight away to investigate. Any orders reported after 24hours from receiving damaged, partially missing or signed for as undamaged and or all received we will endeavor to help rectify the situation but no guarantee is offered due to the acceptance of the goods at time of delivery. We shall be under no liability for any delay or failure to deliver products if the delay or failure is wholly or partly caused by circumstances beyond our control. For example delivery companies being delayed due to traffic incidents or weather conditions. 1) Risk associated with the Goods shall pass to the Buyer. 2) Green-tech may store the Goods until re-delivery, whereupon the Buyer shall be liable for all related costs and expenses (including, without limitation, original and re-delivery charges, storage and insurance). Product that require a phone call to purchase or are made to order not stocked at the Green-tech warehouse may have a long delivery and lead time. For pond liners and bespoke/non stock product these will incur a longer delivery waiting time due to them either going direct from a supplier or having to be special made. During busy periods of the season this can be up to 20 working days.